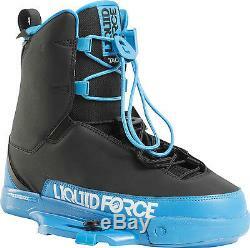 Liquid Force Tao Hybrid Wakeboard 137 Mens + Liquid Force Tao Bindings Sz 10-12. 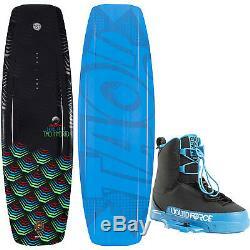 Liquid Force Tao Hybrid Wakeboard Mens + Liquid Force Tao Bindings Sz 10-12. The bindings in this package are available in one size, 10-12. The recommended weight range for a 137 cm wakeboard is 180-220lbs. The binding sizes are based on availability of the bindings. If you have ANY questions we'll respond quickly bringing you 15+ years of riding and instructing experience. Board - The "TAO" of Daniel Grant is all about pushing the limits. At parks all over the world, Daniel flies higher and further than anyone. The new TAO Hybrid provides the launch vehicle and landing pad that he depends upon to keep progressing his riding daily. His new design features a uniquely stepped deck profile that provides increased strength through the center of the board and a lively response, as well as a softer landing platform. The wide center concave and inside channels are shaped perfectly underneath your feet to provide front and rear foot control on demand without the need for fins. The TAO is the perfect option for the true park enthusiast looking for a board that won't ever slow their progression down! Hybrid Technology: Combining a unique hull design with performance flex and snap for the ultimate park approach. Precision CNC Triple-Stringer Wood/PU Core: Three center and rail stringers between PU foam for response and lightweight. Stepped Deck: Provides increased strength in center, lively response, and softer landings. Single Concave Hull w/ Edge Channels through Middle and under Feet: Softer landings from the concave; Edge channels for control off the middle and tips. Concaved Beveled Rail: No edge hang-ups on rails while still giving extra grip on the water when needed. Triax Glass Layup: The optimum blend of springy flex and edge to edge stiffness. Binding - Daniel Grant is unstoppable... You could say freakishly awesome on the water. To help Daniel carve out the future of wakeboarding Liquid Force made him a completely newly designed Tao Binding for 2016. The 2016 Tao Binding has a new, more dynamic upper that features the same Lightweight Uni-Body concept with Liquid Force''s integrated comfort liner and their high performance IPX Chassis. 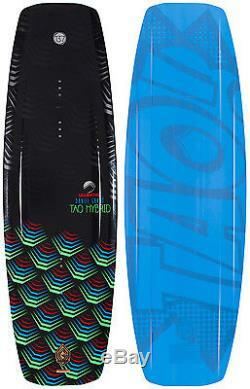 The Tao features their Impact EVA Foam 3D Molded Footbed for soft landings off big booters. While completely redesigned for 2016, the Tao still has the same soft comfort, fit and feel that daniel grant has always demanded. All emails are replied to in less than 24 hrs. 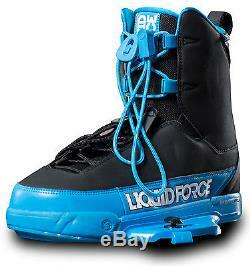 The item "Liquid Force Tao Hybrid Wakeboard Mens + Liquid Force Tao Bindings Sz 10-12" is in sale since Tuesday, April 04, 2017. This item is in the category "Sporting Goods\Water Sports\Wakeboarding & Waterskiing\Wakeboards". The seller is "djsboardshop" and is located in Saint Paul, Minnesota. This item can be shipped to United States.